Barbara is an artist whose distinctive, representational paintings are a delightfully orchestrated blend of both control and looseness. 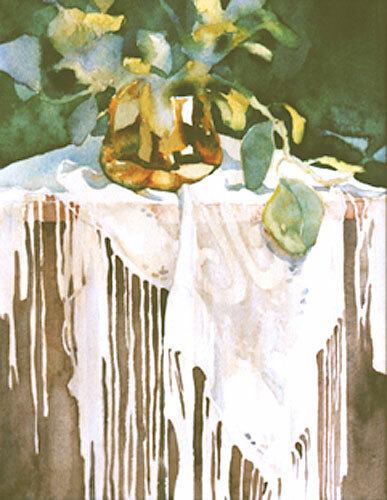 Working in watercolors and oils, Barbara is known for her appealing still lifes as well as for her en plein air landscapes interpreting local scenes throughout Connecticut. Her work reflects a fascination for light, a thorough understanding of color and form and a deep respect for nature. Barbara studied art at the Lyme Academy College of Fine Art in Old Lyme, CT where she was a scholarship recipient. She is an elected artist member of the Salmagundi Club in New York City, Connecticut Watercolor Society, Lyme Art Association, Old Lyme, CT and Mystic Arts Center, Mystic, CT. She has taught art classes at the Lyman Allyn Art Museum in New London, CT and at the Lyme Art Association in Old Lyme, CT.
Barbara is the author of the book Artist’s Projects You Can Paint, 10 Watercolor Tablescapes Loose and Light, published in 2005 by International Artist Publishing. This is a how-to watercolor book designed for the dedicated beginner to intermediate level watercolor student. She is also a contributing artist for the book How Did You Paint That? 100 Ways to Paint Still Life and Florals (2004) by the same publisher. Posters of her “Watercolors of Capri” are available through Grand Image, Seattle, WA as well as online. Barbara is a featured artist in the Spring 2008 issue of Watercolor magazine. She has been accepted into several international exhibitions including the 2008 American Watercolor Society International Exhibition and Mystic International Exhibitions. In addition, Barbara’s work is in hundreds of private collections throughout the U.S. and Europe.